(Global carbon emissions continued along a worst-case track during 2013. Note that estimated temperature increases are for this century only. For context, it took 12,000 years for the world to warm 5 degrees Celsius at the end of the last ice age. Image source: Global Carbon Project.) 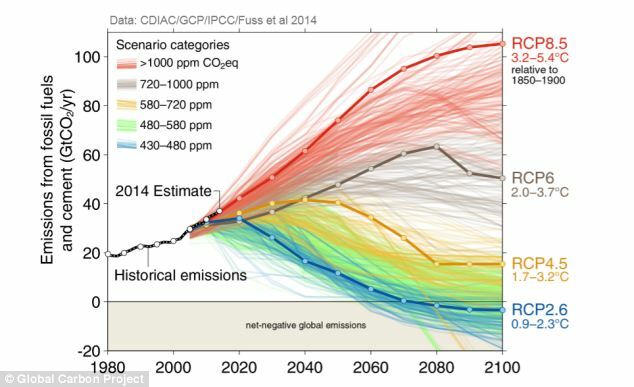 On the current track, global CO2 emissions will double in about 30 years. This pace of emissions increase is along the worst-case path projected by the UN’s IPCC. One that will hit 8.5 watts per meter squared of additional warming at the top of the Earth’s atmosphere and greater than 1,000 ppm CO2 equivalent greenhouse gas heat forcing by the end of this century. Such a massive increase from human sources does not include amplifying feedback emissions from global methane or CO2 stores such as those now apparently destabilizing in the Arctic. Such emissions could add an additional 20 to 30 percent or greater heat forcing on top of the human forcing, according to scientific estimates, by the end of this century. The massive blow would be more than enough to trigger a hothouse extinction event — one that could well rival or exceed the Permian (also known as ‘the great dying’) in its ferocity due to the very rapid pace of the human heat accumulation. The percentages were calculated from Figure 5.4 from Section 5.2.2.3 of the IPCC 4th Assessment Report (h/t to Humanity Rules for the heads up). The IPCC graph shows changes in energy content for two different periods: 1961 to 2003 and 1993 to 2003. The ocean heat figure of 93.4% is almost certainly an underestimate as it only includes ocean heat down to 700 metres (Levitus 2005). Accelerated Warming The second thing to fear about loss of Arctic sea ice is the potential to accelerate climate change on a global basis. A black object gets hotter in the sun than a white object. That much is common sense. Earlier, in describing how melting ice accelerated the melt of more ice, I talked about the fact that dark sea waters absorb up to 90% of the sun’s energy that strikes them, while snow-covered ice absorbs only 10 to 20% of that same energy. The exposure of darker waters speeds up heating of the Arctic, and thus the loss of more ice. But the impact is larger than that. And indeed, it’s large enough to make a difference on a global scale. In June, the Arctic ice cap covers around 2% of the Earth’s surface – around 11 million square kilometers of Arctic ice cap out of a total of 510 million square kilometers of Earth’s land and oceans. And that 2% of the Earth’s surface, for a period of roughly two months, receives more solar energy per day than even the sunniest areas on the equator. Analyzing this, Peter Wadhams of the Global Oceans Physics Program at Cambridge calculates that the loss of the Arctic ice throughout the summer would have a warming effect roughly equivalent to all human activity to date. That is to say, with the ice gone in summer, the planet would have an additional heating effect just as large as the heating effect of all human CO2 and other greenhouse gasses to date. In other words, the complete meltdown of the Arctic could roughly double the rate of warming of the planet as a whole. one million square kilometers. (Figure source: adapted from Stroeve et al. 2012136). There's not as much polarization among experts as you might think. The chart below comes from Stefan Rahmstorf, one of the authors of the paper. He notes over at Real Climate that there aren't two wildly opposing "camps" of sea-level experts, as press accounts have sometimes suggested. Permafrost temperatures are increasing over Alaska and much of the Arctic. Regions of discontinuous permafrost in interior Alaska (where annual average soil temperatures are already close to 32°F) are highly vulnerable to thaw. Thawing permafrost releases carbon dioxide and methane – heat-trapping gases that contribute to even more warming. Recent estimates suggest that the potential release of carbon from permafrost soils could add as much as 0.4ºF to 0.6ºF of warming by 2100.150 Methane emissions have been detected from Alaskan lakes underlain by permafrost, 151 and measurements suggest potentially even greater releases from thawing methane hydrates in the Arctic continental shelf of the East Siberian Sea.152 However, the response times of Arctic methane hydrates to climate change are quite long relative to methane’s lifetime in the atmosphere (about a decade).153 More generally, the importance of Arctic methane sources relative to other methane sources, such as wetlands in warmer climates, is largely unknown. The potential for a self-reinforcing feedback between permafrost thawing and additional warming contributes additional uncertainty to the high end of the range of future warming. 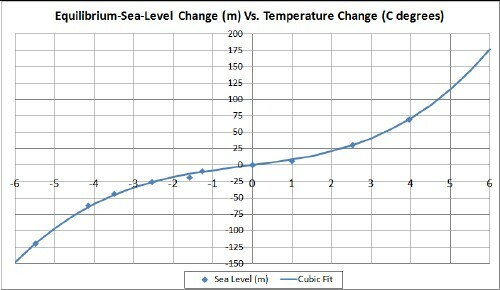 The projections of future climate shown throughout this report do not include the additional increase in temperature associated with this thawing. 5. The complete meltdown of the Arctic could roughly double the rate of warming of the planet as a whole. As a result of the increase in atmospheric CO2, the Earth has been absorbing an excess of about 8 zeta joules of energy/year (the equivalent of a 50 megaton nuclear bomb being exploded every 15 minutes), with almost all of the energy going in to warming the oceans. Only about 2.3% of the excess energy is used to warm the atmosphere, while about 1.3% is used to melt glaciers and about 0.8% is used to melt Arctic sea ice. The loss of the Arctic ice throughout the summer would have a warming effect roughly equivalent to all human activity to date. That is to say, with the ice gone in summer, the planet would have an additional heating effect just as large as the heating effect of all human CO2 and other greenhouse gasses to date. Worst Case Carbon Dioxide Emissions Increases Continue — Hitting 40 Billion Tons Per Year in 2013 (Global carbon emissions continued along a worst-case track during 2013. Note that estimated temperature increases are for this century only. For context, it took 12,000 years for the world to warm 5 degrees Celsius at the end of the last ice age. Image source: Global Carbon Project.) 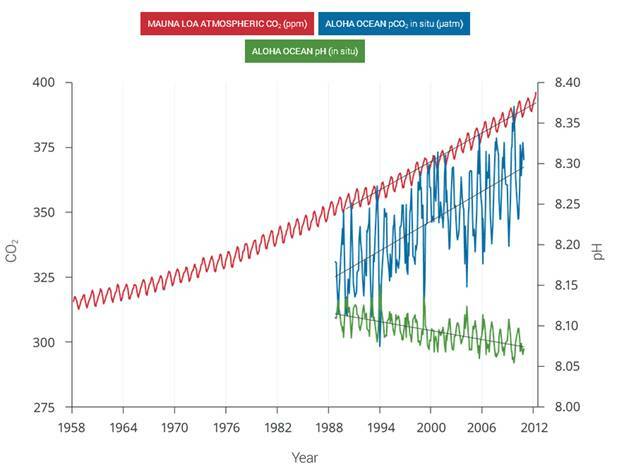 On the current track, global CO2 emissions will double in about 30 years. This pace of emissions increase is along the worst-case path projected by the UN’s IPCC. One that will hit 8.5 watts per meter squared of additional warming at the top of the Earth’s atmosphere and greater than 1,000 ppm CO2 equivalent greenhouse gas heat forcing by the end of this century. Such a massive increase from human sources does not include amplifying feedback emissions from global methane or CO2 stores such as those now apparently destabilizing in the Arctic. Such emissions could add an additional 20 to 30 percent or greater heat forcing on top of the human forcing, according to scientific estimates, by the end of this century. The massive blow would be more than enough to trigger a hothouse extinction event — one that could well rival or exceed the Permian (also known as ‘the great dying’) in its ferocity due to the very rapid pace of the human heat accumulation. (Box 3.1 Fig 1) Plot of energy accumulation in zettajoules within distinct components of Earth’s climate system relative to 1971 and from 1971–2010 unless otherwise indicated. Ocean warming (heat content change) dominates, with the upper ocean (light blue, above 700 m) contributing more than the deep ocean (dark blue, below 700 m; including below 2000 m estimates starting from 1992). Ice melt (light grey; for glaciers and ice caps, Greenland and Antarctic ice sheet estimates starting from 1992, and Arctic sea ice estimate from 1979–2008); continental (land) warming (orange); and atmospheric warming (purple; estimate starting from 1979) make smaller contributions. Uncertainty in the ocean estimate also dominates the total uncertainty (dot-dashed lines about the error from all five components at 90% confidence intervals). The oceans have a huge thermal mass compared to the atmosphere and land surface. They act as the planet’s heat storage and transportation system, as the ocean currents redistribute the heat. 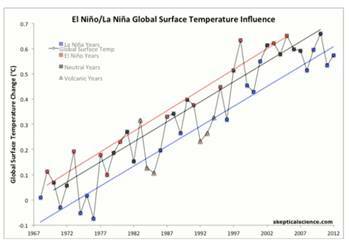 This is important because if we look at the global surface temperature as an indication of warming, we’re only getting some of the picture. The oceans act as a huge storage heater, and will continue to warm up the lower atmosphere (no matter what changes we make to the atmosphere in the future). Figure 1: components of global warming for the period 1993 to 2003 calculated from IPCC AR4 5.2.2.3. The percentages were calculated from Figure 5.4 from Section 5.2.2.3 of the IPCC 4th Assessment Report (h/t to Humanity Rules for the heads up). The IPCC graph shows changes in energy content for two different periods: 1961 to 2003 and 1993 to 2003. The ocean heat figure of 93.4% is almost certainly an underestimate as it only includes ocean heat down to 700 metres (Levitus 2005). The complete meltdown of the Arctic could roughly double the rate of warming of the planet as a whole. Figure 8 - Arctic sea ice volume in June tells a much worse story than coverage alone. June ice volume in 2012 was less than half of the ice volume seen in 1980. June ice volume loss appears to be accelerating. Accelerated Warming The second thing to fear about loss of Arctic sea ice is the potential to accelerate climate change on a global basis. A black object gets hotter in the sun than a white object. That much is common sense. Earlier, in describing how melting ice accelerated the melt of more ice, I talked about the fact that dark sea waters absorb up to 90% of the sun’s energy that strikes them, while snow-covered ice absorbs only 10 to 20% of that same energy. 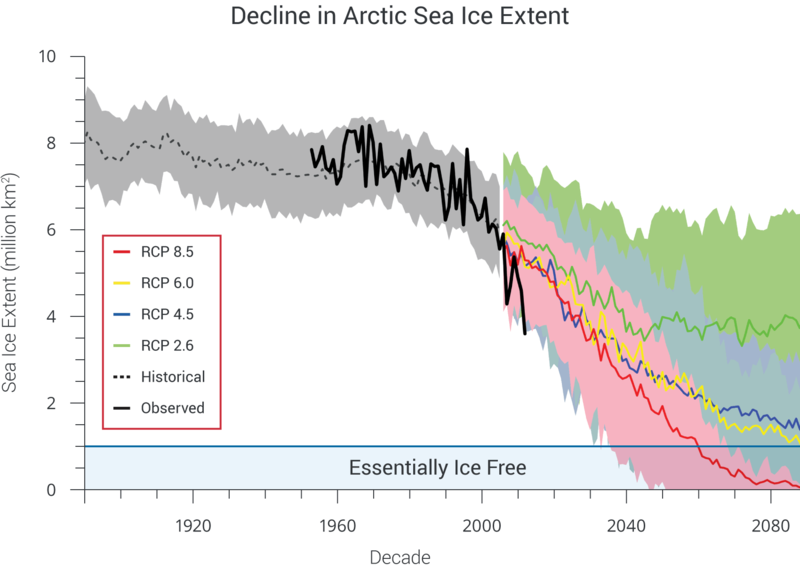 The exposure of darker waters speeds up heating of the Arctic, and thus the loss of more ice. But the impact is larger than that. And indeed, it’s large enough to make a difference on a global scale. In June, the Arctic ice cap covers around 2% of the Earth’s surface – around 11 million square kilometers of Arctic ice cap out of a total of 510 million square kilometers of Earth’s land and oceans. And that 2% of the Earth’s surface, for a period of roughly two months, receives more solar energy per day than even the sunniest areas on the equator. Analyzing this, Peter Wadhams of the Global Oceans Physics Program at Cambridge calculates that the loss of the Arctic ice throughout the summer would have a warming effect roughly equivalent to all human activity to date. That is to say, with the ice gone in summer, the planet would have an additional heating effect just as large as the heating effect of all human CO2 and other greenhouse gasses to date. In other words, the complete meltdown of the Arctic could roughly double the rate of warming of the planet as a whole. The bulk of experts seem to think we'll see somewhere around 1 meter of sea-level rise by 2100 (some forecasts lower, some higher), if emissions continue unchecked. Then there are about a dozen pessimists worried about even larger rises: There's not as much polarization among experts as you might think. The chart below comes from Stefan Rahmstorf, one of the authors of the paper. He notes over at Real Climate that there aren't two wildly opposing "camps" of sea-level experts, as press accounts have sometimes suggested.